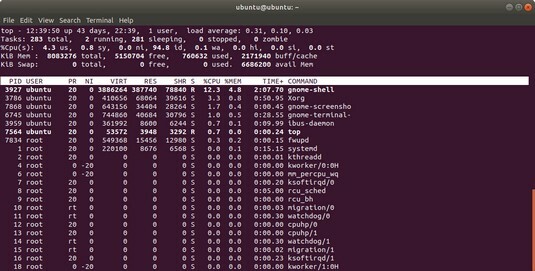 Linux comes with utilities that you can use to monitor these performance parameters. Keep reading to check out a few of these utilities and show you how to understand the information presented by said utilities. To view the top CPU processes — the ones that use most of the CPU time — you can use the text mode top utility. To start that utility, type top in a terminal window (or text console). The top utility displays a text screen listing the current processes, arranged in the order of CPU usage, along with various other information, such as memory and swap-space usage. You can see the top CPU processes by using the top utility. The top utility updates the display every 5 seconds. If you keep top running in a window, you can continually monitor the status of your Linux system. To quit top, press Q, press Ctrl+C, or close the terminal window. The first line shows the current time, how long the system has been up, how many users are logged in, and three load averages — the average number of processes ready to run during the past 1, 5, and 15 minutes. The second line lists the total number of processes/tasks and the status of these processes. The third line shows CPU usage — what percentage of CPU time is used by user processes, what percentage by system (kernel) processes, and the percentage of time during which the CPU is idle. The table that appears below the summary information lists information about the current processes, arranged in decreasing order by amount of CPU time used. The table below summarizes the meanings of the column headings in the table that top displays. USER Username under which the process is running. PR Priority of the process. VIRT Total amount of virtual memory used by the process, in kilobytes. RES Total physical memory used by a task (typically shown in kilobytes, but an m suffix indicates megabytes). SHR Amount of shared memory used by the process. S State of the process (S for sleeping, D for uninterruptible sleep, R for running, Z for zombies — processes that should be dead but are still running — and T for stopped). %CPU Percentage of CPU time used since the last screen update. %MEM Percentage of physical memory used by the process. TIME+ Total CPU time the process has used since it started. COMMAND Shortened form of the command that started the process. This output shows the current time, how long the system has been up, the number of users, and (finally) the three load averages — the average number of processes that were ready to run in the past 1, 5, and 15 minutes. Load averages greater than 1 imply that many processes are competing for CPU time simultaneously. The first line of output shows the averages since the last reboot. After that line, vmstat displays the 5-second average data seven more times, covering the next 35 seconds. The tabular output is grouped as six categories of information, indicated by the fields in the first line of output. The second line shows further details for each of the six major fields. You can interpret these fields by using the table below. procs Number of processes and their types: r = processes waiting to run, b = processes in uninterruptible sleep, and w = processes swapped out but ready to run. memory Information about physical memory and swap-space usage (all numbers in kilobytes): swpd = virtual memory used, free = free physical memory, buff = memory used as buffers, and cache = virtual memory that’s cached. swap Amount of swapping (the numbers are in kilobytes per second): si = amount of memory swapped in from disk, and so = amount of memory swapped to disk. io Information about input and output. (The numbers are in blocks per second, where the block size depends on the disk device.) bi = rate of blocks sent to disk, and bo = rate of blocks received from disk. system Information about the system: in = number of interrupts per second (including clock interrupts), and cs = number of context switches per second — how many times the kernel changed which process was running. cpu Percentages of CPU time used: us = percentage of CPU time used by user processes, sy = percentage of CPU time used by system processes, id = percentage of time CPU is idle, and wa = time spent waiting for input or output (I/O). In the vmstat utility’s output, high values in the si and so fields indicate too much swapping. (Swapping refers to the copying of information between physical memory and the virtual memory on the hard drive.) High numbers in the bi and bo fields indicate too much disk activity. The command requires the IDE drive’s device name (/dev/hda for the first hard drive and /dev/hdb for the second hard drive) as an argument. If you have an IDE hard drive, you can try this command to see how fast data is read from your system’s disk drive. As this example shows, the -h option causes the df command to display the sizes in gigabytes (G) and megabytes (M).